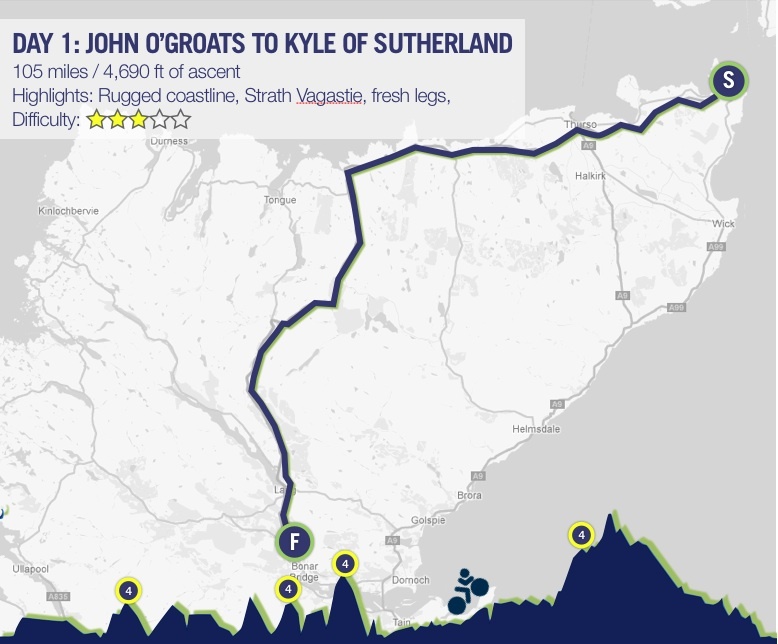 With 2,000 metres of climbing, the stage is an undulating ride through the remotest part of Scotland. As you set off from John O’Groats in front of the fierce North Atlantic coast, you’ll enjoy some of Britain’s quietest roads, eventually reaching the two highest points of the day – Cnoc Staign and Strath Vagastie. 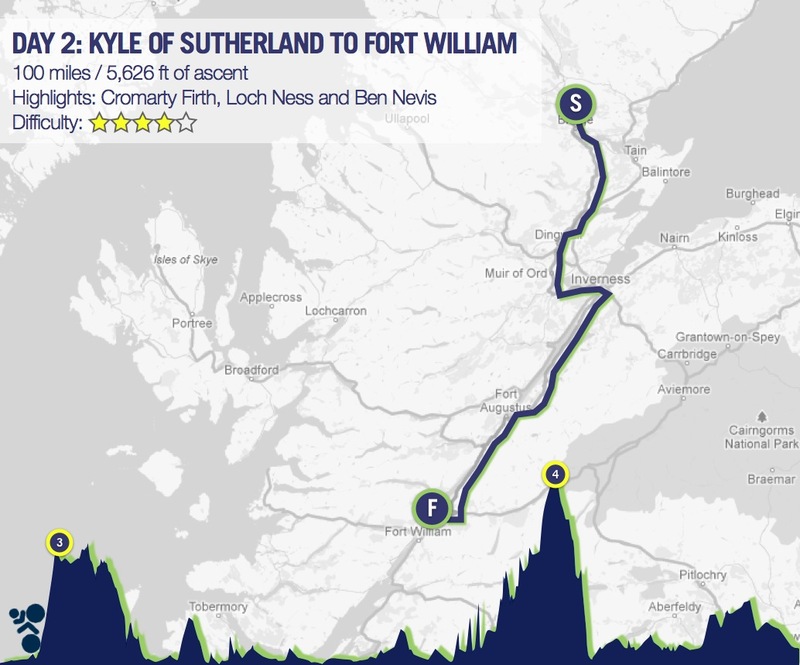 As we leave the Kyle of Sutherland base camp, you’re faced with a slightly hillier stage as we experience more truly spectacular Scottish scenery. First up is the ascent over Easter Ross, followed by the descent to The Cromarty Firth and Beauly Firth to your first pit stop. The route takes you along the banks of Loch Ness to a welcome second pit stop at Fort Augustus. From there you’ll ride into the base camp at the foot of Ben Nevis. After a flat start you’ll take a sharp left up the climb of Glencoe Valley, passing the Glencoe Ski Resort and cycling across Rannoch Moor. There are three peaks at over 1000ft, before the inevitable long descent to the famous landmark ‘Green Welly Stop’ where all roads seem to meet for the first pit stop. You’ll then turn head through Crianlarich along Glen Dochart and Glen Ogle and pass through Strathyre before another climb – the “Pass of Leny” on the way to Callander. They’ll be some steady climbing at the end of the day over the Campsie Fells before a long descent to the overnight camp at Cadder, north of Glasgow. 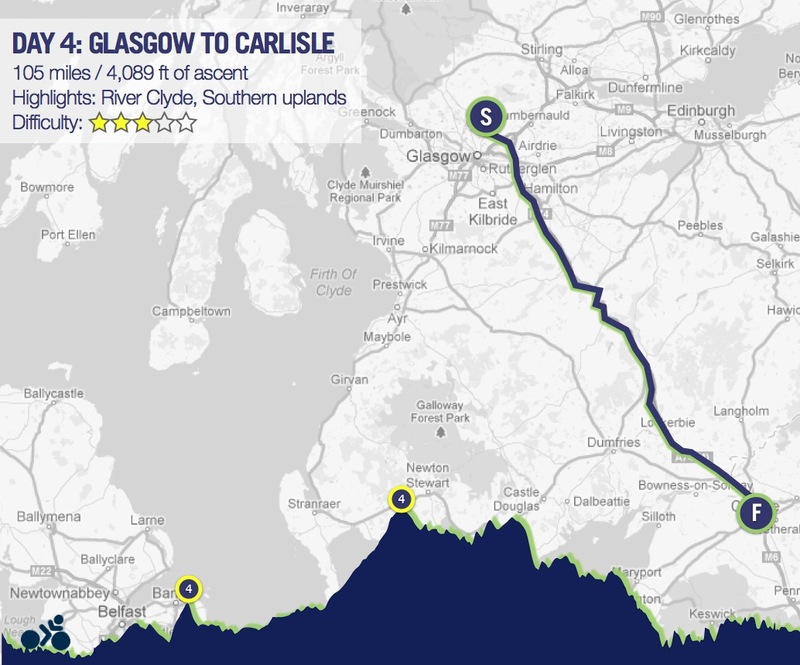 To start off the day’s ride, you’ll skirt east of Glasgow before crossing the River Clyde just prior to Hamilton and Strathclyde Loch. 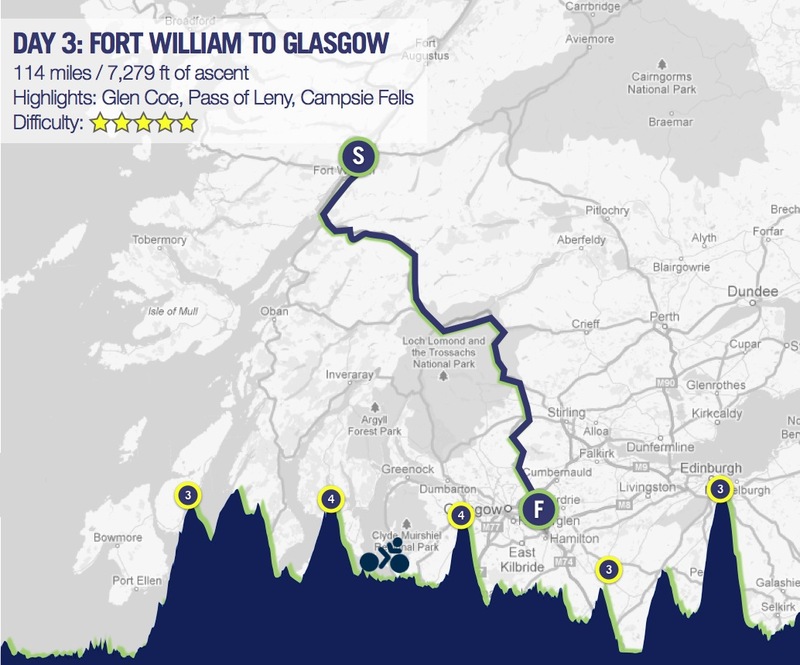 The route then heads in a southerly direction, experiencing a few climbs, up and over the Lowther Hills and Scotland’s southern uplands, running parallel to the M74. With relatively traffic free roads and almost the smallest daily amount of climbing, the route channels through Lockerbie and into Gretna Green before crossing the border into England, and entering the first of our racecourse base camps. 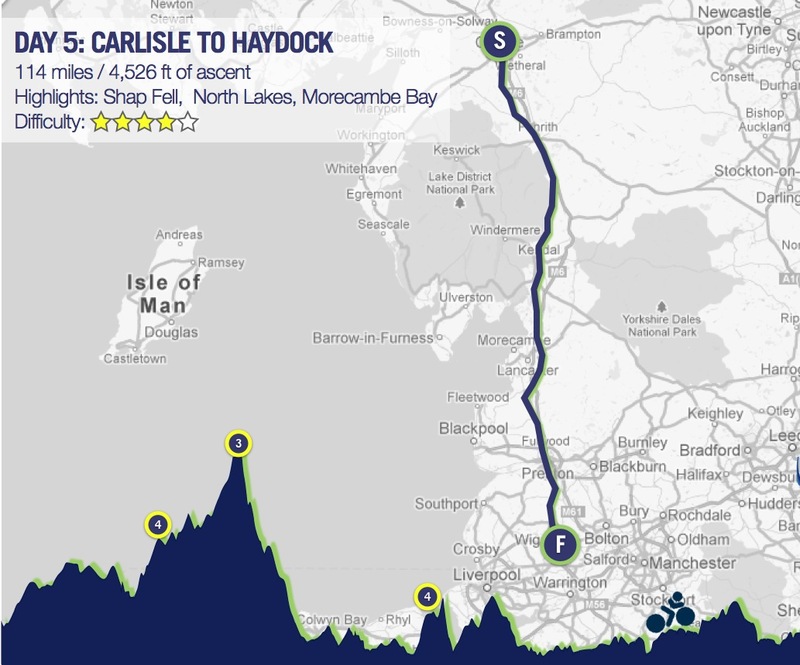 The route now heads away from Carlisle using a quiet road to Penrith – time for you to take in the scenery of the North Lakes. The ride then picks up the classic End to End record route and uses the A6 to pass over the legendary Shap Fell – one of the most revered and famous climbs on JOGLE. Fortunately, you’ll be approaching from the Northern side which is not as severe as the approach from the south. From here, it’s time to absorb the great views of the Lakes to the west before passing through Kendal. Then it is vistas and panoramas aplenty with the Lancashire Fells of Bowland to the east, and Morecambe Bay and Blackpool Tower to the west, as you make your way to Haydock Park racecourse and a well earned shower. The first part of the day runs South through Leominster and then skirts to the east of Hereford before entering the picturesque Forest of Dean at Ross on Wye. 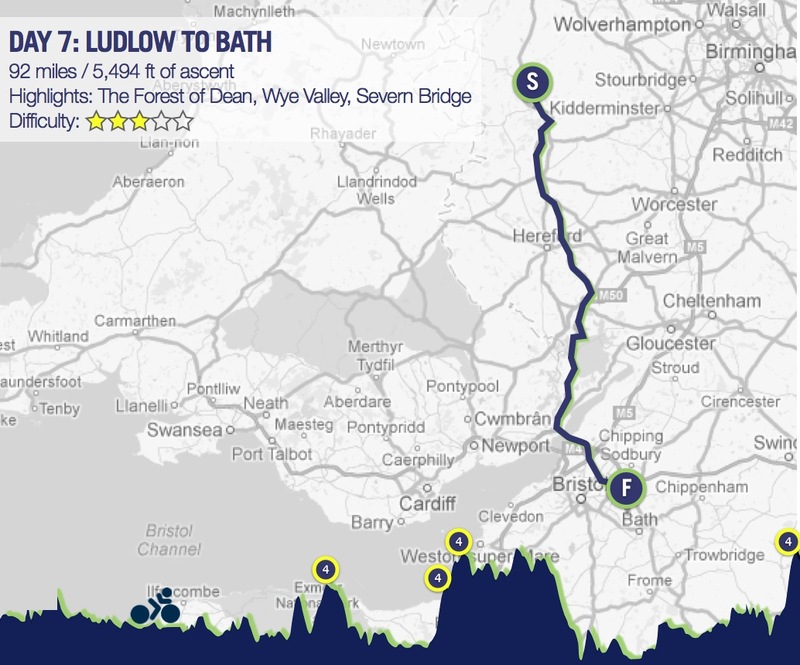 The route runs alongside the river with great views for a number of miles before the challenging climb up to Coleford. Passing through the Forest and St Briavels, make sure you take a moment and look eastwards where you’ll be blessed with fantastic views across the River Severn to the Cotswolds. You’ll then cross the River Severn (with no toll to pay!) taking a route North of Bristol arriving at Bath Racecourse. 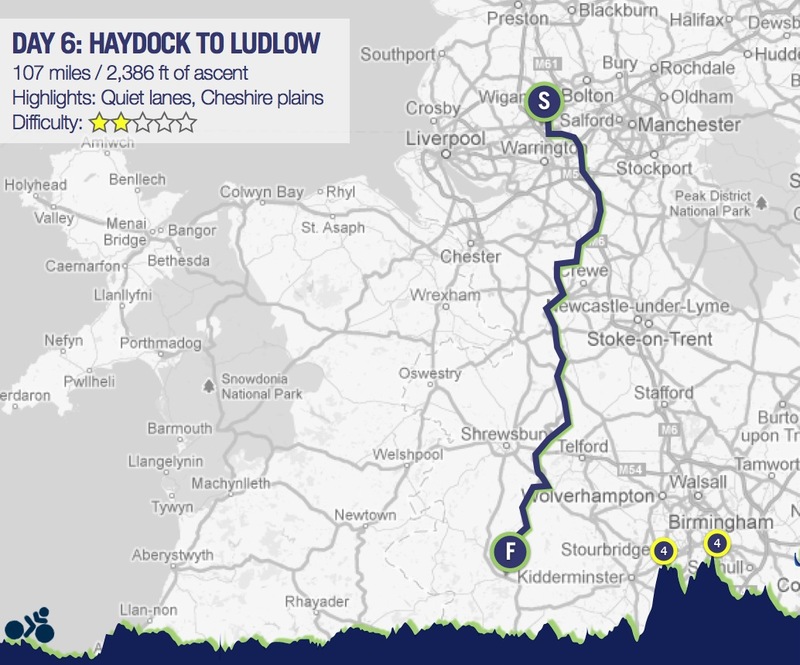 The final climb will be a sting in the tail but the stage is the shortest of all at only 92 miles. You’ll start your day dropping down into Bath, with spectacular sights of the Georgian city, before the inevitable climb up onto the Mendips. 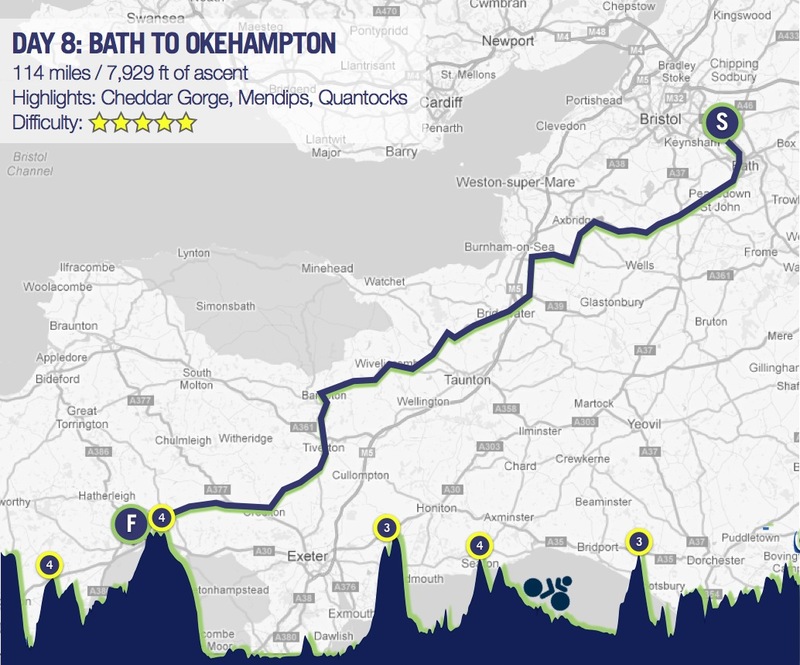 This section is undulating, so you’ll then be treated with a fantastic descent down the iconic Cheddar Gorge. As you then cross the Somerset levels you can enjoy a rare flat section where the road hardly rises above sea level for many miles towards Bridgewater. The route then starts to climb again up over the Quantocks with fabulous views of Exmoor towards picturesque Bampton, and the Exe Valley. On the home straight, you can enjoy the undulating road through to Okehampton with great views of Datmoor in front. It’s the final countdown! To treat you for your final day’s pedalling, you’ll have some stunning scenery to ride through passing over the southern edge of Bodmin Moor. The culture of the southwest then dazzles you, riding through the China Clay workings, past derelict tin mines and the cathedral city of Truro. 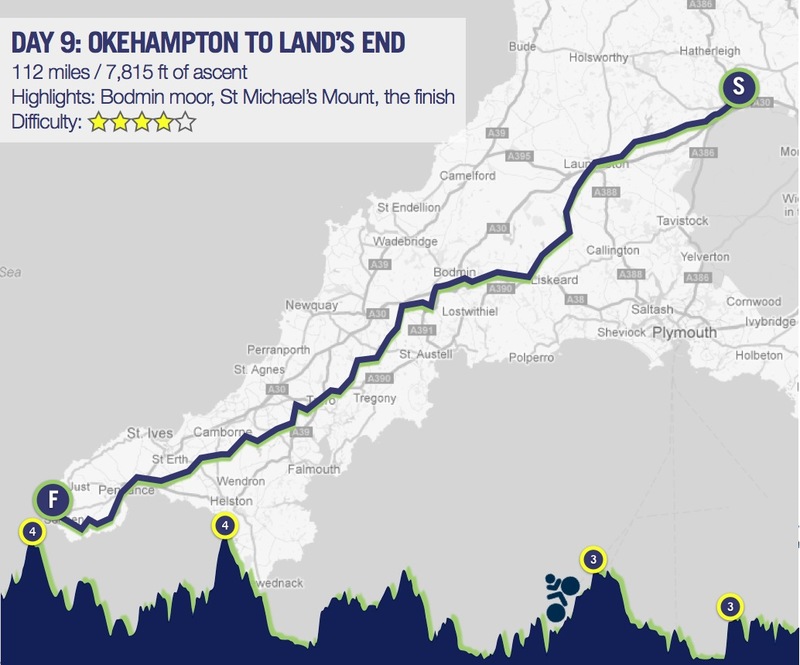 Once you’re enjoying the south Cornwall coast (make sure you spot St Michaels Mount) you’ll pass through Penzance before embarking on a tough climb out of the town and onto the final miles along the beautiful cliffs to Land’s End where the finish and celebration party awaits.